Nineteen immigrants to Connecticut from 16 countries around the world who have made significant contributions to the state and nation were honored at State Capitol ceremonies on Wednesday, April 17, 2019 by the Connecticut Immigrant & Refugee Coalition (CIRC). The individuals, including many who have been in the state for decades and some more recent immigrants, came to the United States from Argentina, Belarus, Brazil, Egypt, Greece, India, Italy, Ivory Coast, Jamaica, Korea, Lithuania, Pakistan, Poland, Romania, Sri Lanka, and Ukraine. Connecticut U.S. Senator Richard Blumenthal at Immigrant Day ceremonies. The ceremony featured remarks by U.S. Senator RIchard Blumenthal, Lieutentant Governor Susan Bysiewicz, Attorney General William Tong and Secretary of the State Denise Merrill, ceremonies honoring 19 immigrants to Connecticut, and special awards. The mission of CIRC, a coalition of about a dozen organizations across Connecticut, is to promote the rights and opportunities of immigrants and refugees in Connecticut and to foster their civic participation. Fatma Antar, retired Prof. of Economics at Manchester Comm. College, on the boards of Muslim Coalition of CT and Islamic Assoc. of Greater Hartford; very involved with Interfaith understanding and resettlement of refugees. Darek Barcikowski, Honorary Consul of Poland in Connecticut; owner of White Eagle media which publishes Polish newspapers in eight states. Peter Barzach, currently Vice President of Operations for Data-Mail and, with his wife Amy, after the tragic death of their baby son, co-founded Jonathan's Dream, the first playground in the U.S. for disabled children, providing opportunities for play with all other children in a fun and safe playspace. Andre Brel, owner of Juniper Homecare which provides healthcare services for thousands of older adults and families throughout the state. He has volunteered in many ways to assist the Russian elderly refugees in the Hartford area. Michael Chambers, an Electrical Engineer and contractor; established the Cricket Hall of Fame and coordinates scholarship, beauty and sports pageants and the West Indian Parade in Hartford every year. Peter Iosifides, a Plumbing contractor, has helped many churches in the state by providing materials, labor and workers, including for two Baptist churches in his community of Norwich. He has given in-kind and financial and mentoring support to the Hellenic Studies Paideia at UConn. Min Jung Kim, the CEO of the New Britain Museum of American Art. She worked at the Guggenheim Foundation and Eli Broad Art Museum at Michigan State University. Georges Annan Kingsley, an Artist and art teacher in Hartford and a radio host. He and his wife volunteer with Asylum Hill Neighborhood as community leaders who work toward acceptance and well-being of refugees and immigrants. Zdzislawa Lempicka, at the age of 16, joined the Polish Home Army (underground) and fought in some of the bloodiest engagements in the 1944 Warsaw Ghetto Uprising. She has spent decades mentoring and educating young people in the Scouting movement. Dr. Mohammed Reza Mansoor, a Cardiologist at Starling Cardiology, is president of the Islamic Association of Greater Hartford, founding president of the Muslim Coalition of Connecticut, and past president of the Islamic Council of New England. He is the author of Stigmatized: From 9-11 to Trump and Beyond – An American Muslim Journey. Dr. Ezequiel Menendez, director of Music for the archdiocese of Hartford, is also the Chapel organist for Ethel Walker School. He co-founded Concerts for Charity and raised money to rebuild Sri Lanka and has assisted charities in Hartford. Dr. Priyamvada Natarajan is a theoretical astrophysicist at Yale. An enthusiastic advocate for science, she speaks in high schools, on the radio and TV on the importance of scientific literacy. Emanuela Palmares, editor and Partner of Tribuna Newspaper and chair and founder of the committee to plan Connecticut's first International Children's Museum. Carla Squatrito, founder of Carla's Pasta, employing over 300 people from 21 different countries. She is a proud member of the National Women in Business Owners Corporation. Sorin Todeasa, a senior Software Engineer in financial technologies, has been a pillar of the Romanian community. Ada Ustjanauskas, the only child of Jacob Gens, was born in 1926 in Lithuania. Growing up in a mixed Roman Catholic and Jewish family she and her mother lived in a house right outside the Vilna ghetto while her father became the Jewish head of the ghetto police. She speaks publicly as a witness to the Holocaust and World War II. She and her family own Cosmos International in West Hartford. Dr . Meera Viswanathan, head of the Ethel Walker School, has written extensively on transformative education. Abby Weiner (being honored posthumously) was devoted to sharing his Holocaust story to many schools throughout the state. He received an Honorary High School Diploma from Avon High School, which showed their love and devotion to him. In addition, Sue Ingall received the Myra M. Oliver Memorial Award, posthumously. The award is given to those who work above and beyond the call of duty to help refugees and immigrants, in memory of Myra M. Oliver’s lifetime of leadership and service. Ingall, who died in January, made immeasurable contributions to the work of the Connecticut Institute for Refugees and Immigrants. She brought “her passion for social justice, her activism, and her remarkable combination of imagination and execution” and led the way in the resettling of immigrants to Connecticut. The Angela R. Andersen Memorial Award, created to honor students who demonstrate deep commitment to issues impacting refugees and immigrants, is named after an individual known for her dedication and passion for helping refugees and immigrants in Connecticut. The 2019 recipient is high school student Sophia Jacobs and the Weston High School Youth Group, for their creation and implementation of a Refugee Youth One-on-One Mentoring Program. The group was conceived by Jacobs, now a high school senior, and meets weekly, providing homework help and getting the students in grades 1-5 on their feet moving! The partnership fills a great need for refugee youth who can feel socially isolated, especially in the afterschool hours while parents are at work. The Salma Khatoon Farid Award was presented for the first time to an educator of longstanding who has made a significant contribution to understanding and awareness. The inaugural recipient was Nancy Caddigan, currently serving as the Adult Education Transition Specialist in The American Place department at Hartford Public Library. In this role, Ms. Caddigan is responsible for outreaching to and assisting teen, young adult and adult immigrant/refugee students enrolled in TAP’s educational programs to successfully transition into post-secondary education, vocational training or the workforce. The award is named for Salma Khatoon Farid, born in India, who immigrated to the United States in 1981. She raised her family in Connecticut and played a fundamental role in nurturing a sense of generosity to the community while supporting the business aspirations of her children, including Tariq Farid, the founder of Edible Arrangements. The National Anthem was led by Laurentiu Rotaru, a well-known opera singer from Romania now residing in Connecticut. The Governor’s Foot Guard presenting the colors. Member organizations in the Connecticut Immigrant & Refugee Coalition include: Asian Pacific American Coalition of CT, Connecticut Commission on Equity and Opportunity, Milan Cultural India Association, Polish American Foundation of CT, The American Place at the Hartford Public Library, Catholic Charities Migration Services, Connecticut Coalition of Mutual Assistance, Connecticut Institute for Refugees and Immigrants, Goodwin College, Integrated Refugee & Immigrant Services (IRIS), Jewish Federation Association of Connecticut, Jewish Family Services of Greater Hartford, Legal Assistance Resource Center, Center for Urban Research, Education and Training, Pakistani American Association of CT, Hellenic Society of Paideia, UConn Health Center and World Affairs Council of Connecticut. CIRC Board members include: Andre Blaszczynski (Chair), Ilana Bernstein (Secretary), Dana Bucin, Claudia Connor, Christopher George, Demetrios Giannaros (Vice Chair/Treasurer), Mui Mui Hin-McCormick, Alan Lazowski, Werner Oyanadel, Richard Shechtman, Zaheer Sharaf, Suresh Sharma and Ban Tran. CIRC is seeking nominations for the 22nd annual CT Immigrant Day. Ideal candidates are those that have made a significant impact on their community and in their fields. Nominees will be able to demonstrate overcoming obstacles to becoming pillars of their community. Immigrant Day is an annual event sponsored by the Connecticut Immigrant and Refugee Coalition honoring local and statewide immigrants who have contributed to their communities and professions. Selected nominees will be honored at a ceremony held at the Old Judiciary Room at the State Capitol in Hartford. Applications are available on this website, or by contacting Robert Fishman, CIRC Executive Director, at RFishman325@gmail.com,or by phone at (860) 916-5869. Completed nomination forms may be emailed or mailed to Robert Fishman, 40 Woodland St., Hartford, CT 06105. •	Build confidence in communication. Fifteen recent immigrants residing in Connecticut will take the oath of allegiance as American citizens on Wednesday, April 4 during a special court session to be held at the Connecticut State Capitol’s Old Judiciary Room at 2 p.m., followed by awards to be presented to leading state residents who immigrated to the United States and have made significant contributions to life in Connecticut. United States Magistrate Judge for the District of Connecticut Donna F. Martinez will convene the court into session for the purposes of administering the oath. The new citizens will recite the Pledge of Allegiance and be presented with official certificates. Following remarks by Judge Martinez and Secretary of the State Denise Merrill, CIRC will present its annual Connecticut Immigrant Day awards. Lieutenant Governor Nancy Wyman will also share brief remarks. The mission of CIRC, a coalition of about a dozen organizations across Connecticut, is to promote the rights and opportunities of immigrants and refugees in Connecticut and to foster their civic participation. Ruth Lazowski, born in Belarus, is a Holocaust survivor who speaks with school groups. Cary Lakenbach, born in Italy, is the current Board Chair of the Jewish Federation of Greater Hartford and an actuary. Bassam Gayed, born in Egypt, is Multicultural Services Coordinator at the Otis Library in Norwich. Irena Rak Dzierzbinski, born in Belgium, teaches French and Spanish in middle school in Darien and is active in Girl Scouts. She hosts a Polish-English radio program at Fairfield University. Naeem Khalid, born in Pakistan, started Sam’s Food stores and employs 1,000 in his businesses. He formed a charity, Sam’s Children, to assist needy children in Connecticut and is active with the Pakistan American Association of Connecticut. Bruce Tsan-Tang Liang, born in Taiwan, is the Dean of the University of Connecticut School of Medicine. Vani Nidadavolu, born in India, operates an Indian Dance School and works part-time for Edward A. Jones. She holds an MA in Commerce and is a Philanthropist. Trinh K. Duong, born in Vietnam, came to Connecticut as a refugee and now works with new refugees and immigrants, helping them to resettle. She received her degree in Accounting from UConn. In addition, Alicia Kinsman, Director and Managing Attorney of Immigration Legal Services at the Connecticut Institute for Refugees and Immigrants will be receiving the Myra M. Oliver Memorial Award.The award is given to those who work above and beyond the call of duty to help refugees and immigrants, in memory of Myra M. Oliver’s lifetime of leadership and service. Two student groups will also be recognized as recipients of the Angela R. Andersen Memorial Award, created to honor students who demonstrate deep commitment to issues impacting refugees and immigrants. It is named after an individual known for her dedication and passion for helping refugees and immigrants in Connecticut. Sixth-graders from the Interdistrict School for Arts and Communication in New London will be recognized for their project, “Community Faces-Humanizing the Immigrant Label.” The second group is Teens4Citizenship, a Hartford Public Library and Hartford Public Schools collaborative program. As "Citizenship Guides," these high school immigrant students support family and community members on the path to Citizenship and upon turning 18 pursue their own citizenship. Opening remarks at the ceremony will be offered by Chris George, Executive Director of the Integrated Refugee and Immigrant Services (IRIS), and CIRC Board member. The National Anthem will be led by Chris Nelson, a native of Ghana and current Goodwin College student. The Governor’s Foot Guard will be presenting the colors. 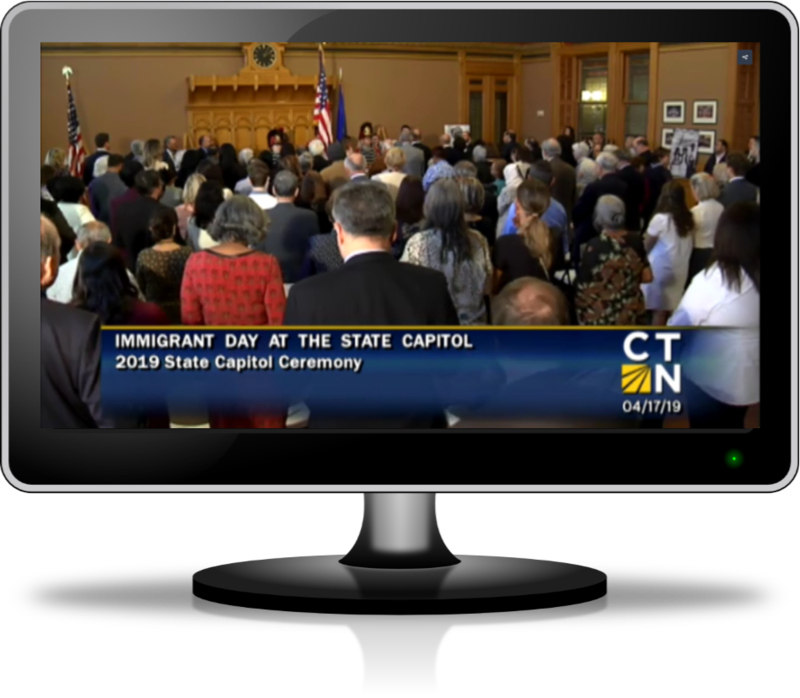 To view CT-N video of the Immigrant Day ceremonies, click here.